My buddy and I are in the process of swapping a 16T onto my 740 using the 90+ manifold. This will be the last big performance upgrade to the car while I save up for a better transmission to swap in so I can run a fat a** turbo in the future. This is our big ticket issue: The 16T will sit flat on the manifold, but one of the 4 which hold everything together hits the portion of the manifold where exhaust #4 bends upwards into the exhaust outlet housing. It wont allow a nut to fit between the bolt and the housing for us to tighten. Here is picture so you can visually see what I am talking about where the figure in black is the manifold and the red is the bolt. The bolt cant squeeze in enough to be able to get a wrench or something around it to tighten. It cant fit in at all. Last edited by 89_740Turbo; 10-18-2018 at 07:07 PM.. So you're saying the stud from the manifold is too long so it hits the turbo? Just cut it short then? You'll likely get better help if you post some actual photos of the problem. I'm having difficulty understanding, when you say manifold, do you mean the turbine housing? I don’t get it sorry. 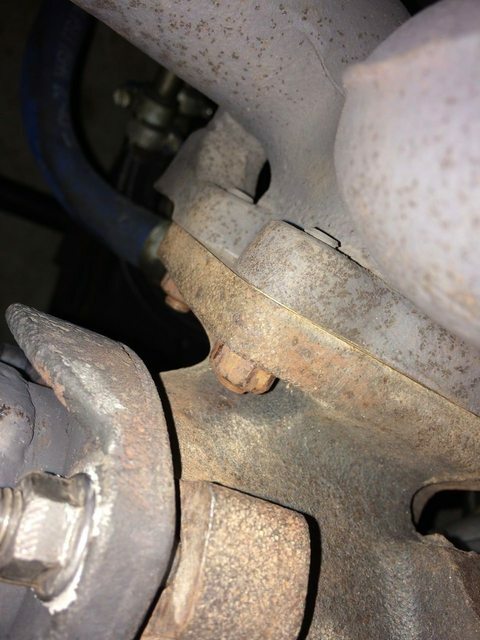 Are you using bolts to fix the turbo to the manifold? There should be studs in the manifold and you just use nuts to tighten the turbo.. 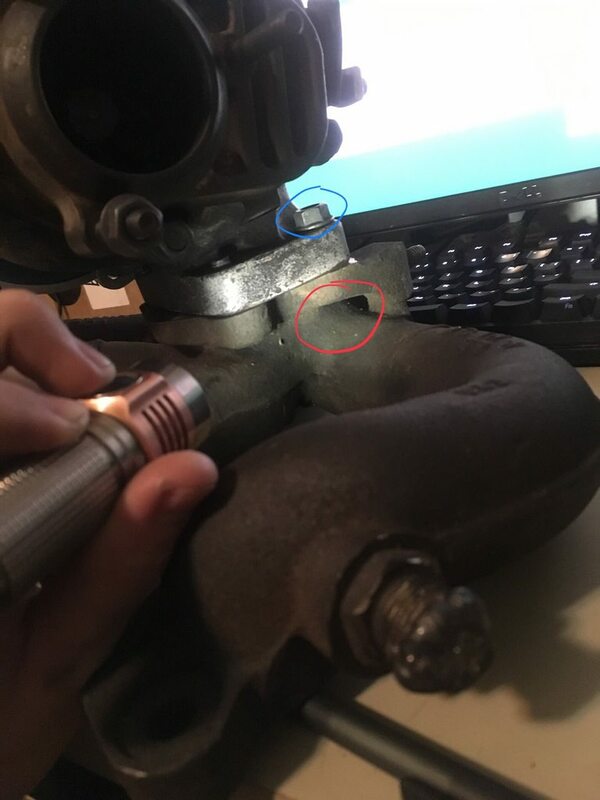 I'm using the studs in the manifold but the studs, even when twisted all the way into the turbine housing, still sit so far down against the exhaust that I cant fit a bolt between the stud and exhaust housing to twist onto the stud. I have to take pictures when I get out of work on Saturday. Does this help explain your issue? Your original post is confusing because a bolt is not the same as a stud. 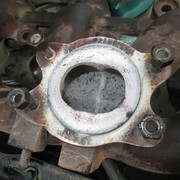 The manifold studs should just pass through the turbine housing holes and be secured with a nut. Not sure why you'd want to twist anything on. The manifold studs do, and we drilled them out to make them larger. The issue is that that once everything is in place, there is no room to stick a nut underneath the manifold stud because the manifold's curve wont allow a nut to squeeze in. Should not be a need for a nut behind the manifold. Maybe I'm confused. What style turbine housing do you have on your 16T? IIRC the angled flange housing may cause some issues with fitting one nut, but a straight or conical housing shouldn't cause any problems. Here is a pic of the clearance on my 16T w/ conical turbine housing. Last edited by oldschoolvolvo; 10-18-2018 at 08:26 PM.. 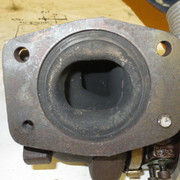 If the stud hole in the manifold has been enlarged. You can use a stepped stud so the hole in the manifold can be 10mm thread and the other end of the stud will be 8mm to match up to the turbo. Should have put studs in the manifold, instead of drillng through and using bolts. Yeah, there shouldn‘t be any nut or bolt behind the manifold where the red circle on the photo above is, the nuts just go on from the housing side. I had to grind the lip off the flange nuts I used to mount my turbo, but yes you have to screw the nut down as the turbo moves forward as stated above.